On the day that I am bound to leave for Leufsta, the Dutch Book Historical Society published a short update on my activities in their column ‘De Boekenmolen’, or The Bookwheel. De Boekenmolen is a monthly report of the Society where members are introduced to each other, based on a question relating to their current activities, love for the book, or other issues from the world of the book. It is no surprise that I was asked to tell something about my upcoming research in Sweden. The text is only available in Dutch, but regular updates from Sweden can of course be found at this website. The Dutch Book Historical Society (NBV) is a society set up for all lovers of old and modern books in all their forms. The NBV was established in 1993 and is a dynamic society with approximately 600 members, ranging from prominent scholars to amateur researchers, from journalists to antiquarian book dealers. I joined the NBV when I was working as an intern for the Short-Title Catalogue, Netherlands (STCN) of the National Library of the Netherlands in 2009. 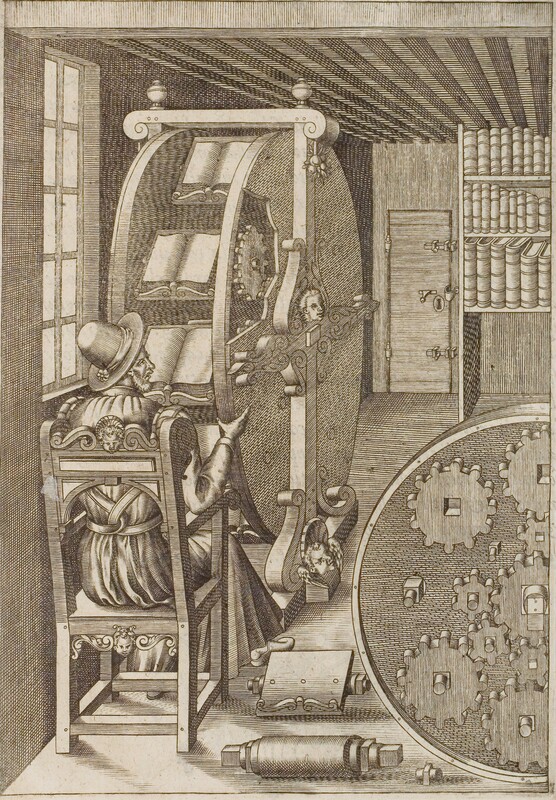 And in case anyone wonders what the name of the column, De Boekenmolen, is supposed to mean: a bookwheel is some sort of rotating bookshelf, designed to read a number of books in variable order. One of the few surviving copies can be admired in Bibliotheca Thysiana in Leiden.